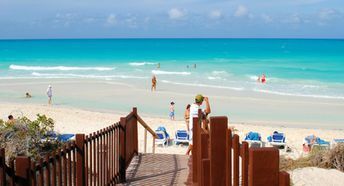 This beach ranks #8 of the "Best beaches in Cuba"
Along the coast there are about dozen of 5-stars beach resorts operating on the "all inclusive" basis. Room rates start at $150 per night. Fly to Havana Airport (HAV), or fly to Varadero Airport (VRA), or fly to Santa Clara Airport (SNU). If you first get to Havana or to Varadero, then you should next get to Santa Clara by Viazul bus. Next hire a taxi. In 1999, the island was connected to the mainland by a 48 km long causeway, so transport accessibility is very convenient now. The best time for a beach holiday in Cayo Santa Maria is a warm summer half of the year.